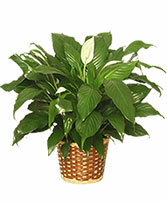 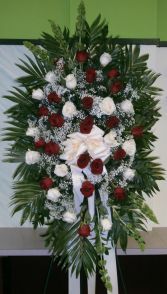 Funeral Flowers from EAST MEADOW FLORIST - your local East Meadow, NY. 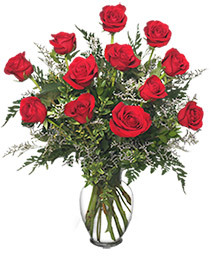 The Loving Memory Heart by East Meadow Florist is a touching tribute to honor a loved one or close friend. 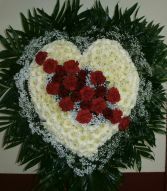 A white heart embraces a cluster accent of red roses and carnations. As awlays, our desingers will be happy to customize this tribute in your choice of colors. 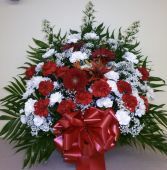 The Graceful Tribute Basket by East Meadow Florist will convey your warmest thoughts to friends and loved ones. 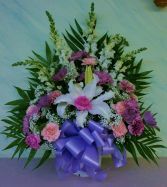 In soft shades of white, purples, and lavenders, it will gracefully convey your message of peace and sympathy. A beautiful standing spray of red and white roses accented with babies breath and greens makes a majestic statement of sympathy. 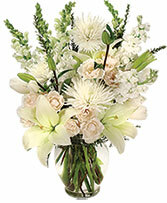 The Cherished Memories Sympathy Basket By East Meadow Florist will convey your most treasured thoughts to friends and loved ones. Lillies, Daisies, Carnations, and other flowers combine to make a truly memorable tribute.